UK grocery company, Tesco, has decided to pull out of their American Invasion and take a $1.8 Billion write-off (with the favorable UK exchange rate – only 1.2 Billion Pounds – it still doesn’t soften the blow of the astounding loss.) Tiffany Hsu’s LA Times article points to Tesco’s misunderstanding of what the public wants and the dire consequences of trying to compete with the Wal-Marts, Costcos, Trader Joes and the like. If Tesco believed those were their competition, their analysis was very off – regardless of recession or not. Tesco saw themselves as something they were not – and in America, it’s foolish to think that customers will save bad branding by finding the hidden gems behind whatever facade is presented. Any way you slice it, its unfortunate that Tesco’s invasion of the American market was dead on arrival. It had a lot more to do with branding, design and store locations than what Americans do or do not want. Admittedly, my exposure is limited to their locations in the Los Angeles market, but it quickly became very clear how Fresh & Easy was positioned counter-intuitively and ineffectively. The first store I visited was a huge space on heavily trafficked tourist destination Hollywood Boulevard. It was large, dark and depressing. Another location was also in midtown on a heavily trafficked car artery with no abundance of parking spaces. And the last one I was in a week ago was probably the best model of what they should have been doing all along – a small, bright and colorful store in a heavy pedestrian area near USC. Beyond their questionable locations and early dreary decor, they should have positioned themselves as the perfect last minute spot to pick up quality prepared meals and sundry items on the way to work or on the way home for dinner. They couldn’t/shouldn’t have felt they could compete with the established big markets. 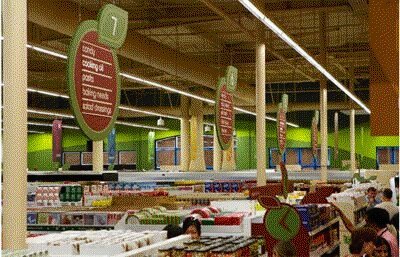 The article compares them to a Wal-Mart, but Tesco should have positioned Fresh & Healthy as more akin to a refined and healthier 7-11 – like their own Tesco Metros back in the UK. That healthy option would have been the right aspirational touch – especially in Southern California. Fresh & Easy might have worked if they had stronger positioning. It seems they were even unclear on who they were meant to be. Because of that, their marketing never worked. It’s a shame, because if you look at their location near USC, they could have focused on smaller spaces in higher foot-traffic (or more easily accessible) areas to create something akin to the Marks & Spencer Simply Food product in the UK. Another similarity to M&S in the USC location was the automated tellers that allowed staff to be focused around the store to help out in ways you certainly don’t see in a 7-11. The promise of getting in and out of a market in five minutes with inexpensive essentials and healthy prepared meals would have been something that might have made it a success. Short of that, its another example of a move that a company should have never ventured in the first place. Or, its an example of a good thing that never had the required clarity and forethought to drive success. Fresh & Easy is Dead. Long Live Fresh & Easy.